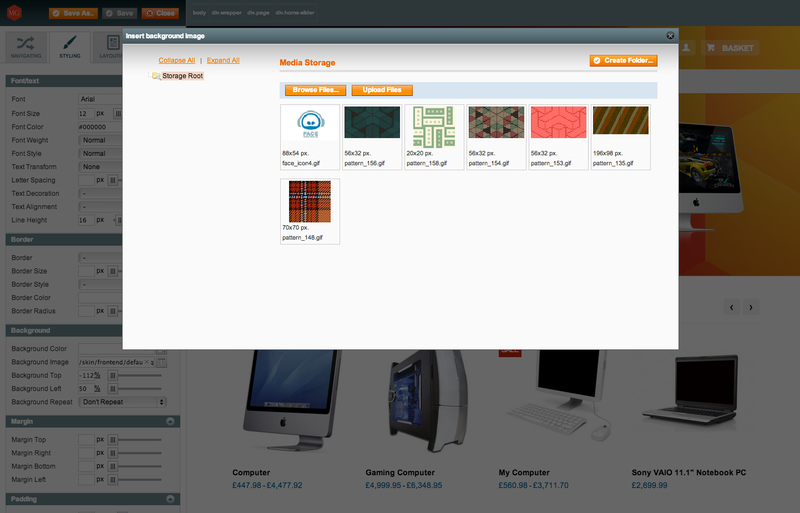 ThemerMG comes with a point & click, drag & drop interface - and it's possible for anyone to customize any part of a Magento site. 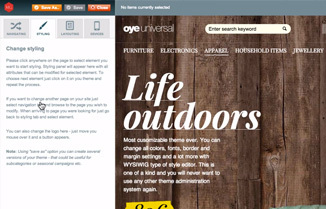 ThemerMG is a wysiwyg type CSS editor and drag & drop layout editor for Magento. Make endless sub-versions of themes with little to no coding skills. What You See Is What You Get. Period. 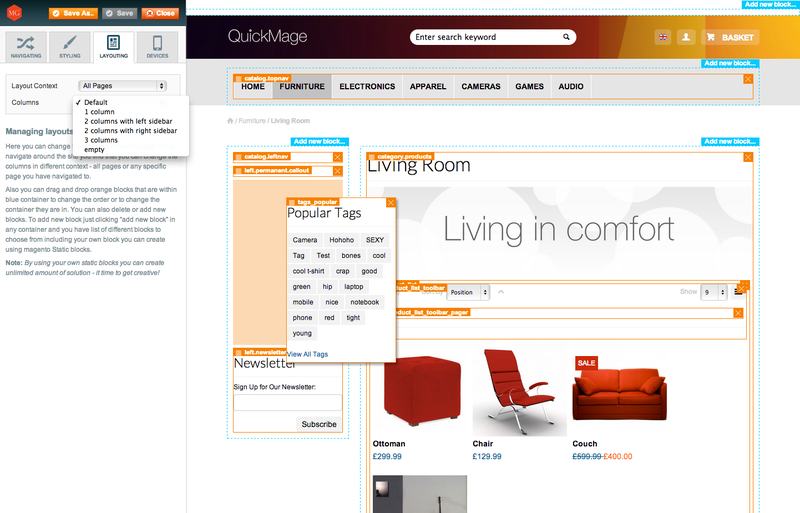 With a point and click, drag and drop interface it is possible for anyone to customise every part of a Magento site. The whole system works so that you can build several designs and click through your store without pushing it live. That means you can easily build new features and test them out on the same system using real data so when you are done you can be 100% sure it works well. Themer enables its users to create many different Tunes (variations) of the themes you have installed. It is generally used when you start a new design, experiment with an idea you have or would like to test performance/conversion of different tunes. No, it won’t overwrite anything. 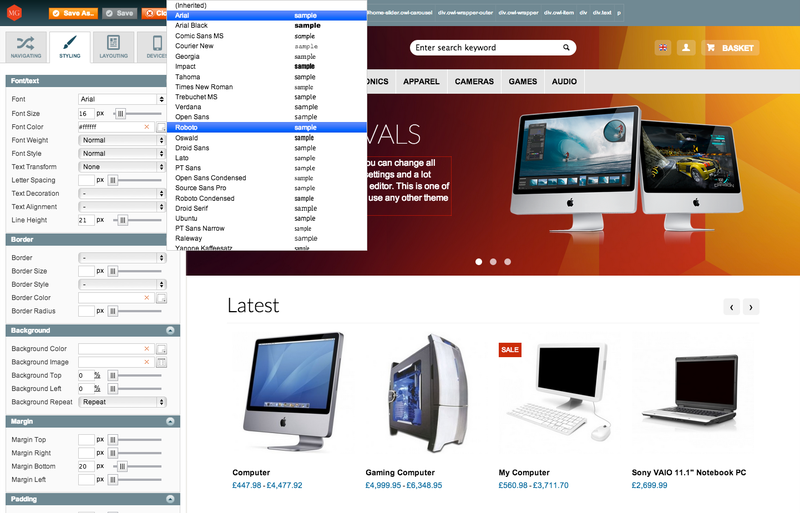 Themer’s layout, content and style changes are held in separate database tables and not in the file system. The module will simply apply the content and layout changes later in the execution flow or in the case of CSS, simply load it later. Themer works great with any of the Magento default themes and also any store bought modern, standards compliant theme with no JS errors present. Just install your themes as usual and they will automatically show up in the theme management administrator panel. NB! ThemerMG is not Magento2 compatible. Google fonts or simply select from a list of web-safe fonts. Make it bold, control line and letter spacing to fine-tune your text looks to perfection. Background images and rounded corners. Click on any element of your page to apply a background color or an image. You can also set borders and make CSS3 rounded corners. Background images management is done by using Magento built in media manager to make everything work more seamlessly and effectively. Move the elements where you need them. 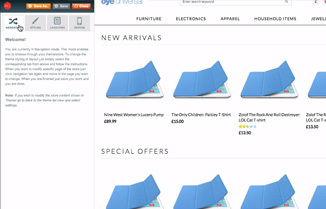 With margins and padding you are able to create gaps between the elements of your page. Advanced users can also use float and clear to align them out as desired. This is where you can simply drag and drop a block or a widget to a different column. Reordering is just as easy. 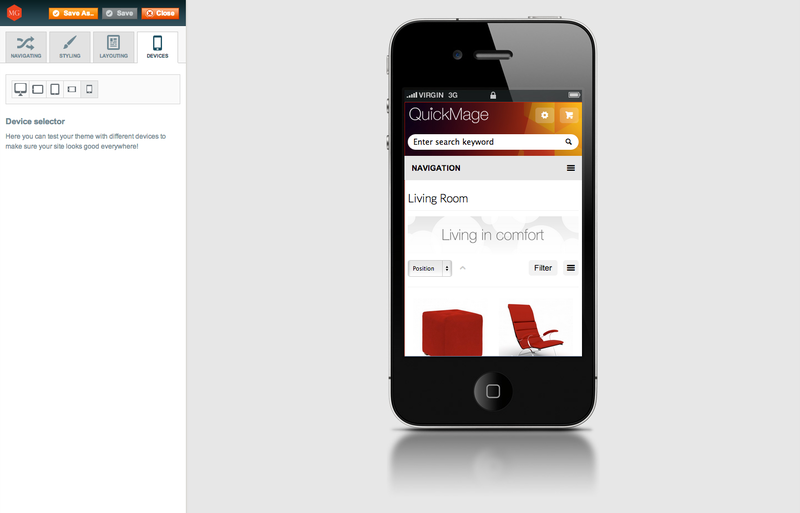 You can also chose the context where you want the layout changes to take effect. 1, 2 or 3 columns? 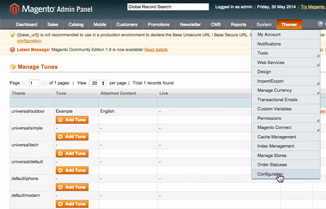 Change the column count of every page with a simple dropdown. 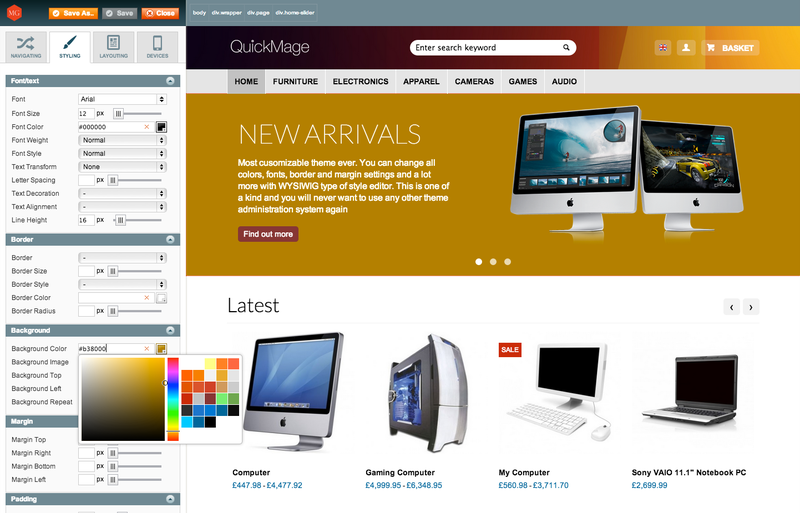 Have a full control over the blocks and widgets displayed on your page. 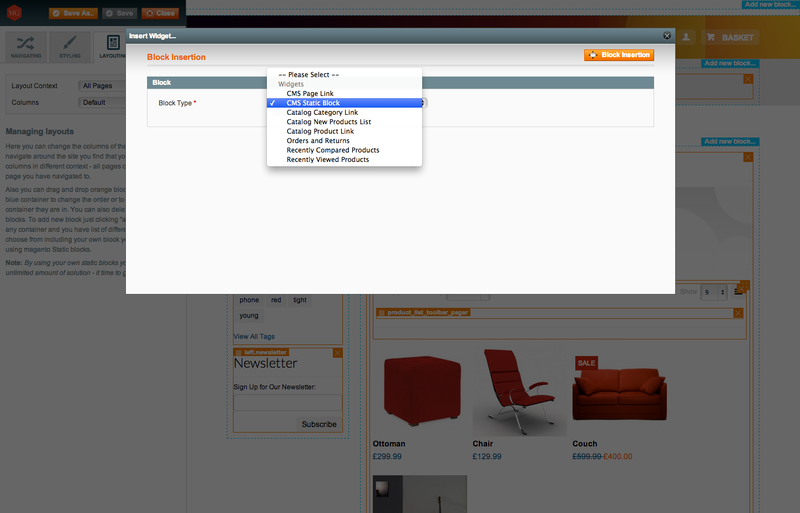 Simply add new Magento blocks (provided by core and community modules) and widgets to a desired column and hit save. Don’t want to show some blocks on certain pages? Removing them is just as easy. Quick overview of the product and its features.